If the goal of Jewish education is to help Jewish people live better lives, they thought, we need to think harder and more critically about the desired outcomes that support this flourishing. 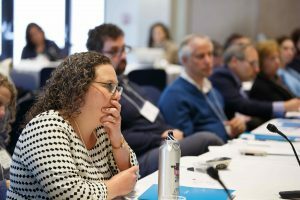 That conversation led to a 2015 conference at Brandeis that brought together researchers in Jewish and general education, from Jewish studies and the learning sciences, for an unprecedented exploration of how Jewish education can be expanded and enriched through a focus on learning. Now selected essays from conference participants have been collected into a new volume, Advancing the Learning Agenda in Jewish Education (Academic Studies Press, 2018). It offers creative and critical perspectives on unexamined assumptions about learning in Jewish education, and promotes the idea that learning is never only about subject-matter knowledge but is always at the same time about the learner’s relationship to the subject—an idea that has taken hold in the science learning community.